Grazing, grazing. . . .
Well, I’ve had a busy day, not all of it good, and I don’t feel like doing anything else. And then I remembered that I hadn’t written a blog post in a while. Good heavens, more than two weeks! My apologies. I’ve got a lot of things going on, so I’ll fill you in some of it. First, Neighbor K and I are getting up early and walking. When I say “early,” I do mean “early.” As in 4:00 am Central Daylight Time. I am not joking–we get up and go walking in the 4:00 am hour. And walk for 30 to 45 minutes. She takes out the Daft Pug for a quickie and then we start walking. We’ve seen some, shall we say, interesting things on our early morning treks, as well as had a really good early start to our day. She goes to work, but sometimes, I go back to sleep. I’m working on not doing that anymore. But I have gotten lots done when I get up and stay up. We started last Monday, and while I got up and went, she didn’t sleep well that night, so I was on my own. I didn’t waste the chance, though–I went back inside, did morning prayers and chanted for a while, then went out about 5:45 and walked. Last lap involved me dropping off my hand weights and going straight up the street to McDonald’s for a free decaf on the last day. (I’d walked there on Sunday too, but didn’t walk 2 or 3 miles beforehand.) Last Friday it rained when a cold front came through, so I did the same thing I did Monday, and the rain was over by 5:45 am. Second: the New Orleans Saints won yesterday against the Tampa Bay Buccaneers. I’m only a real football fan when the Saints are in the playoffs on the way to the Superbowl. I was, indeed, in shock when they went the last time, so I just wait for it to happen again. They’ll play the Houston Texans this week, I think, so we’ll see what happens. Irony: a lot of folks who came to Houston after Katrina stayed after Katrina. I see a split loyalty at that game, and probably a lot of torn emotions. But I’m not a football aficionado, so I’m not so worried. You remember years ago there used to be the SAVE Club, where every month you’d get a box filled with new and different products for you to try? (I got them for a while in the early 80’s for a while, right after I got married–the first time.) They were about $10, if I remember correctly, and they sent coupons and new and interesting products like Simple Green cleaner and. . .ramen noodles. Yes, I’m not kidding. At the time, ramen noodles were a new gourmet item, and were at least $1 a packet. Hard to believe that they’re now about a quarter, (in health food stores they might be more but healthier ingredients) but times change. I can’t find any info about it on the web, but I’m sure it was called the SAVE club. Then in in 2000, there came StartSampling.com, and getting curious, I discovered that I still have an account and can still earn points and stuff. I haven’t thought about that site in years, until just now. I donated a bunch of my points after 9/11. In fact, the account still had the GER’s house as the address; I’ve since updated that. Oh, dear. . . .
Now, in 2014, there are so many subscription boxes to choose from. Makeup. Jewelry. Dogs. Cats. Clothes. Handymen/Handywomen (tools and such.) “Favorites” picked by minor celebrities. (I got Cosmetique a few times, too.) Even a monthly box for. . .cyclic needs, if you know what I mean. I kid you not. Check out FindSubscriptionBoxes.com if you’re interested in seeing more of these. You can also find lots of info and pictures on these subscriptions on Pinterest. I haven’t thought about this kind of thing in years, and had no idea it had expanded so much. I know what you’re thinking: “Why are you bringing this up, Amy, and what does this have to do with all things foodie?” Well. . . .
You like to have delicious nibbles? Looking for something new? 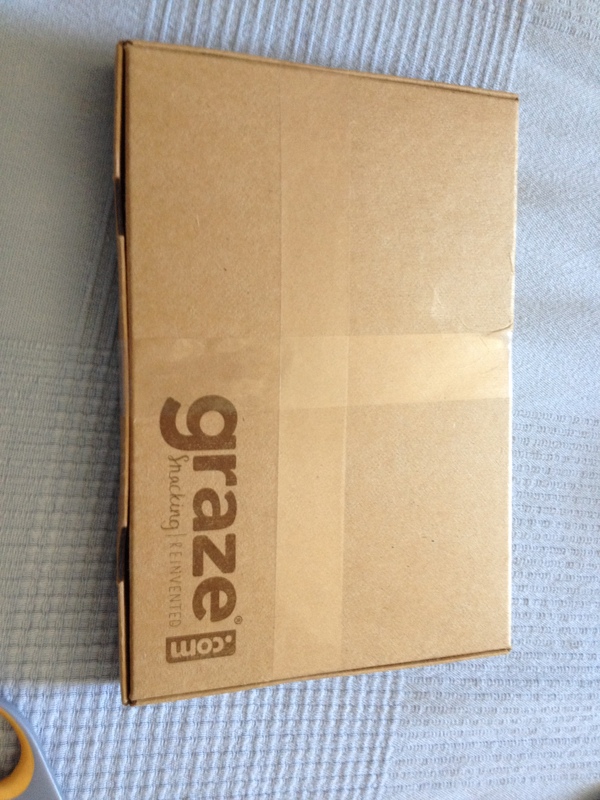 Then Graze.com is the place for you. No, I did not get paid for this. I’m just passing along info. But it’s great!! Neighbor K said she was considering giving them a try, since she got a flier at work for them. I told her to go for it. My flier came from a magazine a week or two ago, and said that the first box was free. Woo hoo! You can cancel at anytime, and even speed up or slow down the delivery of the boxes, all online. 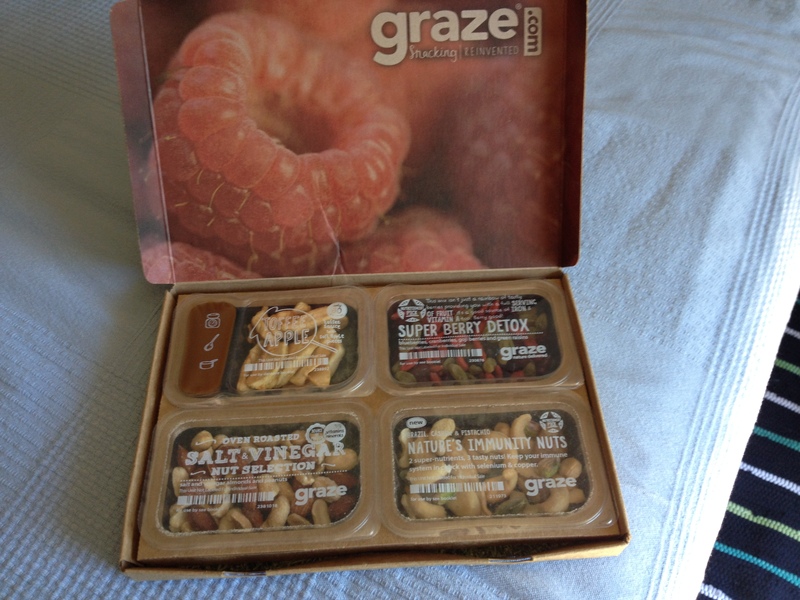 My Graze treats are here! 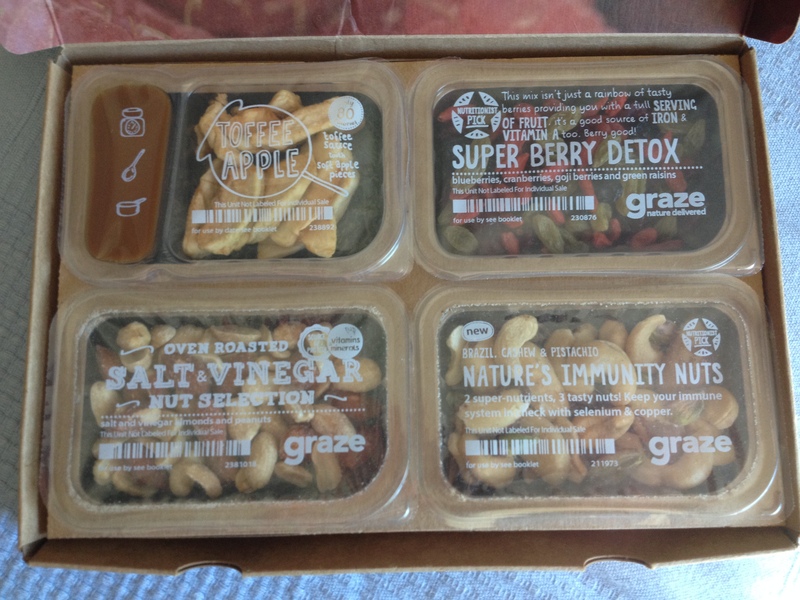 Graze.com wants to revitalize snacking with healthier choices like the ones you see here. No GMO, no HFCS, no artificial flavors or colors, and no trans-fat, either. They were about a cup of each, I think, selected according to what I told them I prefer–gluten free, of course, and one or two other criteria. However, there are 90 different type of snacks, and you can “like,” “love,” or “trash” them. You tell them what you like and they send you healthier, portion-controlled snacks from what you would like and what you tell them. You can get a box weekly, bi-weekly, or more often, just go online and tell them, it’s simple. You can read more about the people and the company here. Graze says it’s not a good choice for folks with allergies, because they can’t guarantee everything to be allergy-free. Be forewarned if you’re allergic. Portable planting! (With the clean, empty plastic containers in it.) Start your seeds here. All of these little snacks were great–because I nibbled them all day on Saturday. 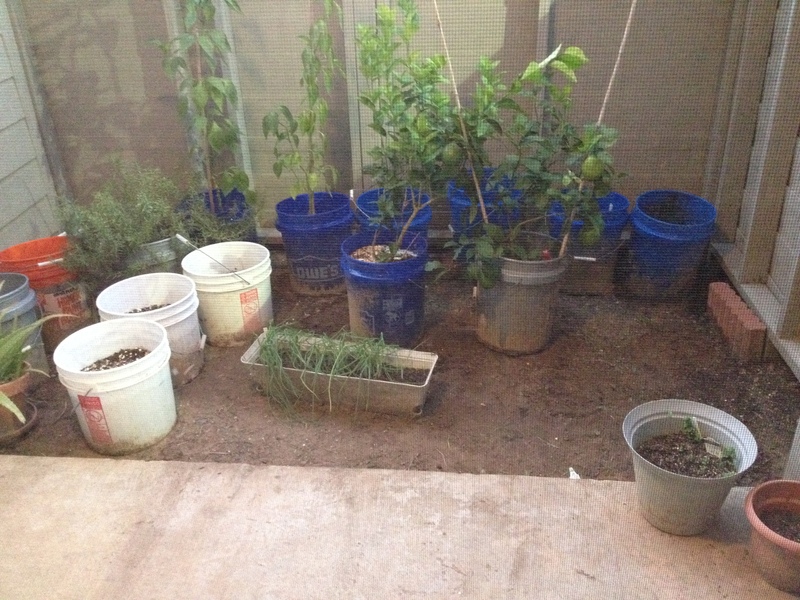 Yeah, yeah, I know–but I also cleaned up the HeatCageKitchen garden, and dug up some roots of the “houseplant gone wild” that me and Neighbor K battle occasionally, plus did housework and laundry. The maintenance guy cut most of that mess down and took it away, but I dug up as much of the root system as I could and took out another weed that was masquerading as a plant in the monkey grass. So, I was workin’ it, and nibbled off and on. See what I did? And now, it’s neat again. Yes, the snacks were very good. The Super Berry Detox was nice and sweet, and so was the Toffee Apple, although it had sugar in the small amount of toffee sauce. Never had that before, much as I like apples. I won’t be buying goji berries anytime soon, but if they send it again, no problem. The nuts, well, they were nuts, and I like just about everything but chestnuts, so no complaint there, either. The salt and vinegar taste is a little strong next to the unsalted ones, but I got used to that, too. Oh, yes, well. . .I went to cancel it, and the second shipment is already on its way. I’ll cancel it after that’s done. I’ve “snoozed” them so they don’t come for a while. Or, I could just keep snoozing it and get one occasionally if I want one. I’ll think about that for a while. You’re probably wondering how my my little “nibblebox” cost, aren’t you? Well, the first one is free, and subsequent boxes are $6.99. That makes each snack about $1.75 each. If you work in an office, how much do you spend getting something from a vending machine? Is anything in that vending machine as healthy? Sometimes it is, sometimes it isn’t. (With all due respect to folks who run and service said vending machines, some of us prefer healthier fare, we’re not judging you.) You can have the box sent to your office, or to your home, and the little sealed plastic packets fit nicely in a purse, lunch bag, briefcase or desk drawer. You can also gift a box to other people at any time from your online account–they get a box in the mail, there’s a gift card with it, it doesn’t cost extra, and they’ll be happy when they see that you sent it. How cool is that? Don’t know what to get for a birthday or a special occasion? 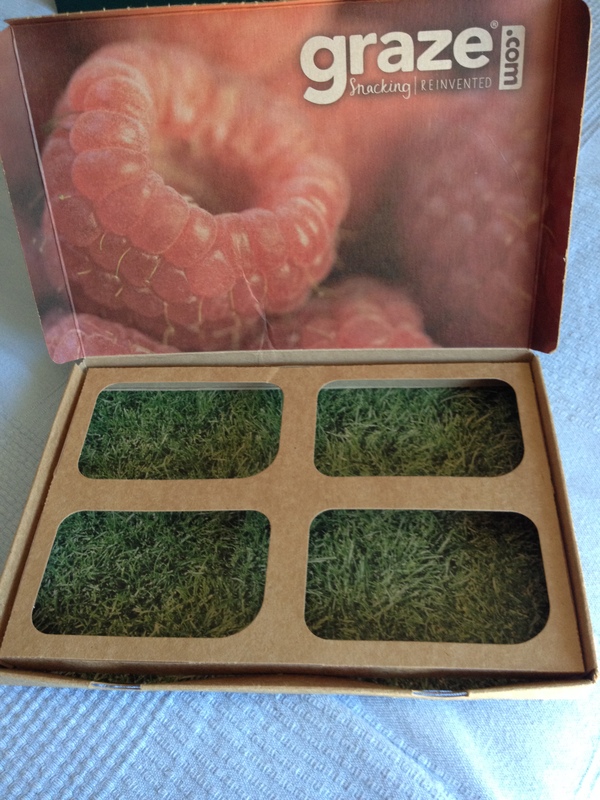 With a week’s lead time, you can send a tasty “nibblebox” and the recipient will know you care. Oh, and the holidays, including Christmas, are coming, so keep Graze in mind, OK? They are soon planning something called the “Big Box,” consisting of 5 larger, resealable bags of different snacks; those are $25 a box. But you have to join the waiting list for that–but when they’re ready, that’s also a good thing for a holiday gift. 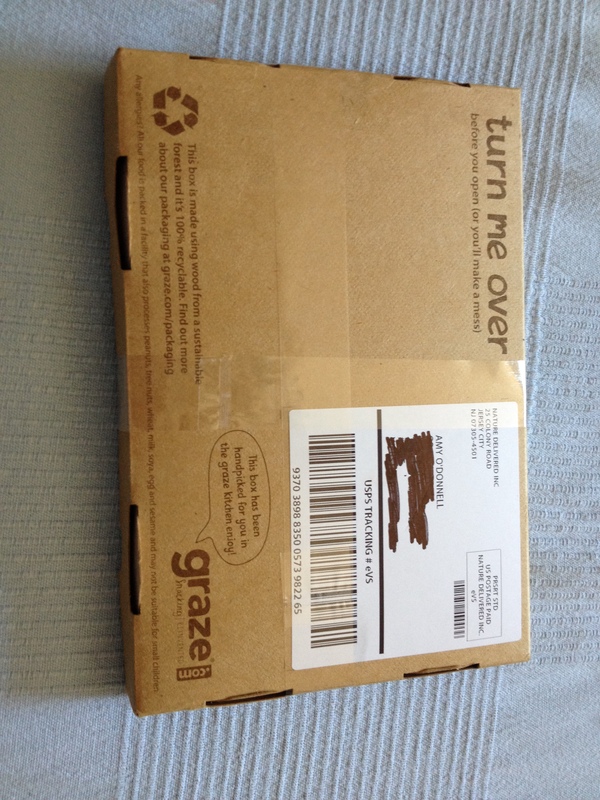 Now, if you’re interested in trying out Graze’s neat “nibbleboxes,” here’s what you do–go to the website and where it says in small print under the “Get Started Now” button, “have a special code? enter it here,” you put this code into the popup field: AMYO2RN7B. Why would you do that? That’s the code on my packing slip to give to friends to get your first and fifth box for free. No kidding–fifth box is free if you decide to keep going with it. Within a week, you could start nibbling! Now I don’t expect that hundreds of people will try to use the code, but I figure a few might consider it, so I’m putting it here for anyone who might like to try a “nibblebox.” Not sure how many times it will work, either. I think I get points or something, but mostly I figure a few of my readers just might be interested, so why not? Again, no commitment, and cancel anytime. But you just might like it, too. What would be wrong with that? Well, it’s getting late, and the 4 am wake-up alarm happens before you know it. I’ll try to write again real soon, so I can tell you about the delicious baked pear, and a few other things. Oh, and more gluten-free stuff, too.